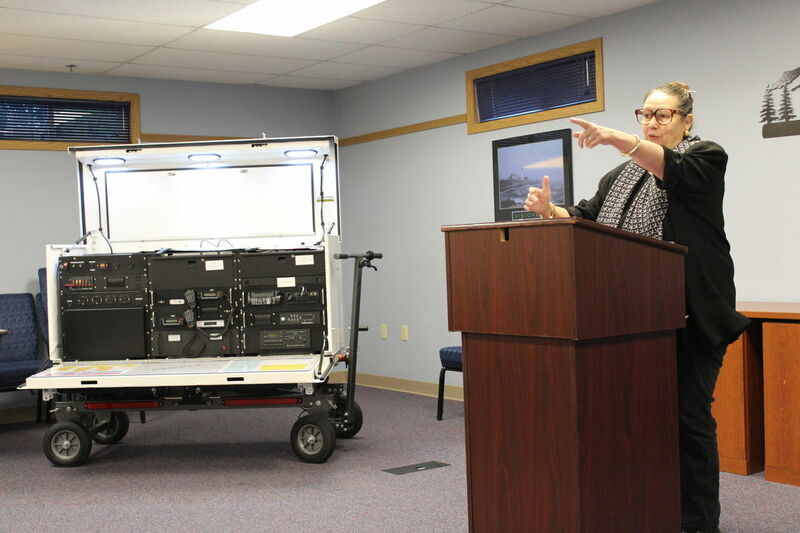 Columbia County’s Emergency Operations Center has added enhanced capabilities to its operations with the purchase of three portable communications units. Columbia County is the first jurisdiction in the state of Oregon to employ such devices. Dubbed “PodRunners” by the manufacturer, the small but powerful equipment is designed to be fully deployable to even the most remote locations in the county. 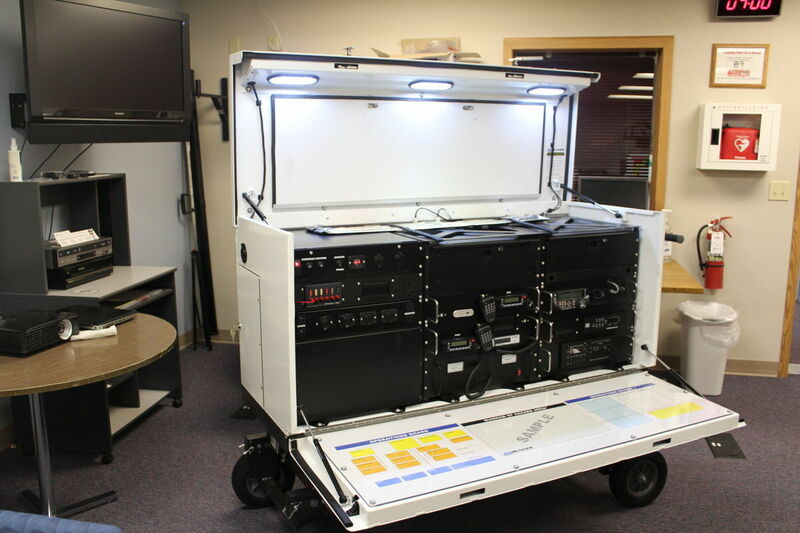 “These PodRunners are among the most elegant solutions I’ve ever seen for communications because they are completely and highly portable,” Director of Emergency Management, Steve Pegram said. The units were unveiled at a press conference on Wed. Oct. 18, attended by Congresswoman Suzanne Bonamici (D) and Senator Betsy Johnson (D). Each are customized for Columbia County needs, and easily transportable by a single individual. The scissor-lift carts can be loaded onto a standard two-inch trailer hitch, ride like a cargo carrier on the back of a vehicle, and can roll along the difficult terrain found in much of the county’s forested and hilly areas. Because of their size, the pods can also be brought inside buildings, making them more versatile than the larger, vehicle-based and parking lot-restricted units commonly used in the field. Purchased through a competitive state grant funded by the Department of Homeland Security, the units can cost upwards of $20,000 each, depending on upgrades and customizations. Bonamici said people are always asking her about the budget and what is being done with federal dollars. She said she was glad the Department of Homeland Security was able to provide the funds for the PodRunners because keeping communities safe will save lives and money in the long run. Columbia County’s secure, weather resistant enclosures are equipped with antennas, tuners, batteries, a generator, and full radio capability including amateur band, UHF, VHF, and public safety. They also include Wi-Fi, computers, monitors, cameras, printers and working surfaces. “Throughout Northwest Oregon, we’ve seen towns under water, schools washed away, supplies and help slow to arrive, police and fire struggling to talk to each other, and it al comes down to the fundamentals. How do we communicate? And today radically improves the situation,” Johnson said. The communications centers will be operated by trained volunteers from the Columbia County Amateur Radio Emergency Service (ARES), as well as county emergency center personnel. ARES, a part of the Columbia County Citizen Corps Council, provides back up to emergency communications to jurisdictions during disasters as well as other critical services. Two of the pods will be stationed in Clatskanie and Vernonia to be used as communications centers for command, communications, data and incident management when needed. Stay up to date with the latest and greatest!